Whether it’s your daily commute or an extended road trip, by the end of the average week many of us have accumulated a lot of time behind the wheel of our vehicle. A good ergonomic setup helps make your drive more comfortable and improves your driving. Once you’ve adjusted your seat, remember to sit in it properly. 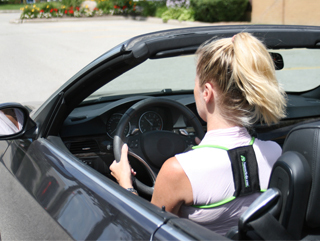 Wear the Posture Medic on longer drives or commutes to support your back. Your car seat is the most important part of your drive. It's where you will sit for that long commute to and from work every day of the week. It should be comfortable. And it should NOT HURT you. Car companies have done a lot to help make seats more comfortable and adjustable for you, but you need to adjust it to suit your body and your needs. Please refer to your car manual for further guidelines. Slide the seat so that you can operate the pedals with just your feet. Make sure you can easily lift your feet completely off of the pedals. Sit so that your legs are not squished and your thighs are relaxed and supported. Your knees should be slightly bent. Locking your knees reduces circulation and can make you dizzy or even pass out. Make sure you can easily move your legs and pelvis so you can easily shift position during your commute. This will relieve pressure points and keep blood circulating during long drives. Staying in a cramped position for too long may lead to Deep Vein Thrombosis. This is one area that is often overlooked when adjusting the driver’s seat. Your seat tilt ensures that your back is supported and that you don’t hold your neck too far forward or backward as you drive. Tilt the seat so that it supports your bottom and your thighs evenly. You don’t want pressure points at the end of the seat. Make sure your thighs extend passed the seat so that the back of your knees do not touch the seat if that’s possible. Your legs and pelvis should have ample ability to move and shift position without detracting from your driving. This will relieve pressure points and keep blood circulating during long drives. 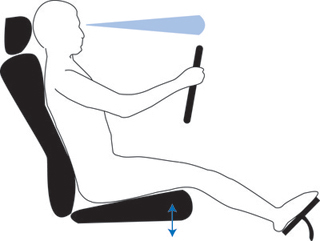 Setting the proper angle for your driver’s seat can be a little bit tricky. Most of us arbitrarily adjust the seat angle the first time we sit in the car and then forget about it. You want to make sure that you’re not too laid back or uptight in your chair. Recline the seat between 100-110 degrees - look at the picture for reference. Your shoulders should no longer be in line with your hips but solidly behind them. This supports your upper body while maintaining an upright and attentive posture. Remember to sit correctly in your seat. If you have a tendency to lean forward from the waist or hunch your shoulders forward in your seat, wear a Posture Medic while driving to help you maintain the correct alignment of your upper body. Adjusting the height of the driver’s seat can dramatically improve your driving ergonomics and comfort. Raise the seat so that you have a good view out the windshield, but not so high that your legs will interfere with the steering wheel. You may need to re-adjust your leg room accordingly. The lumbar support can be a saving grace during long drives, or if you already suffer from back pain. If your car seat does not have an integrated lumbar support you should get an after market one and add it to your seat. Adjust the lumbar support so that the curve of your spine is evenly supported. Make sure not to over-extend your back. Pushing your back too hard in the opposite direction can cause different injuries. You want your lumbar support to provide a nice, gentle, and even support. Some vehicles allow you to tilt the steering wheel and even to pull it closer to your body with a telescoping steering column. Use all the options available to you to adjust the reach of your steering wheel. You want your shoulders to be back and relaxed. The tilt can be adjusted so that your wrists remain straight. The proper position to minimize arm fatigue and maximize driving control is to hold the wheel at the 3 and 9 o’clock positions. Posture Medic is specifically designed to help you overcome your poor postural habits and retrain your body to stand up straight with our easy Stretch - Strengthen - Stabilise program. © 2018 Posture Medic. All Rights Reserved. Please note this product contains latex. Posture Medic® is not a toy. Keep away from children under the age of 12 years old. Posture Medic® is designed to be used ONLY as detailed per our instruction manual and our website. Use of Posture Medic® in any other way shape or form is the sole liability of the user. Injuries as a result of failure to follow instructions are the sole responsibility of the user. Posture Medic® is not meant or designed to cure, treat, or heal any disease or illness. Information found on our website is provided for information purposes only and is not a substitute for professional medical advice.